Five ambitious families enter the court of intrigue driven by a dream of power, wealth and prestige. 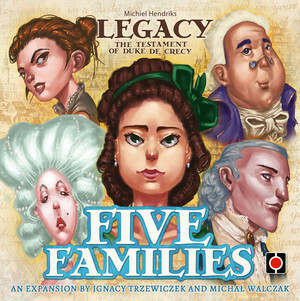 The Five Families expansion introduces a new level of interaction to Legacy: the testament of Duke de Crécy. Players are able to offer their family members and traits to the other players. Each has a powerful ability, but they also come at a cost: favor tokens which are used to buy mighty new actions. The question remains: use it or lose it? The Five Families expansion also includes a set of cards to expand the classic gameplay: New Patrons, with new ways of scoring; Birth Events, to add more drama; Daisy Track, a new twist to your solo games.